Patience might be a virtue, but for those in the coaching profession, it's not necessarily a luxury granted. With impatient fan bases, expectant athletic departments doling out big money and teams needing to deliver on promises of bowl wins and brilliant seasons, the third year is often a benchmark. By the third season, the excuse can no longer be that a coach doesn't have his players or his system in place. He can no longer be considered a newbie to the conference, because there are certainly less-experienced coaches around. He's judged by his record on paper and his product on the field. For third-year coaches Brady Hoke or Will Muschamp, that's too bad, because the records aren't good. And the products might be worse. AP Photo/Phil Sandlin Will Muschamp could only watch as Georgia Southern ran past Florida. Muschamp's Florida Gators dropped to 4-7 this weekend after a 26-20 loss to Southern Conference opponent Georgia Southern, marking the program's first loss to an FCS team. Yes, Florida is dealing with a slew of ailments (nine season-ending injuries, 20-plus starters missing at least part of a game). In that regard, it's hard not to feel for the Gators. But it certainly can't be an excuse, especially considering Georgia Southern has lost 19 scholarship players (of an FCS-level 63 scholarships) to injury this season. It's quite the changeup for a Florida fan base that enjoyed an 11-2 season in 2012. At this point last season, the Gators were preparing for what was to be their fourth top-10 opponent of the season. Florida was 2-1 already in those matchups and would finish 3-1 after beating Florida State. Now they enter the Florida State game with a should-be-fourth-string quarterback leading a sputtering offense and fans missing Ron Zook and his 17-14 record against BCS teams. But maybe they can find empathy with Michigan fans. The Wolverines went 11-2 in Hoke's first year. Maybe they were spoiled. Maybe the schedule was stacked in the Wolverines' favor. Maybe something was "owed" to Michigan after three years of Rich Rodriguez (who isn't doing too badly at Arizona right now in his second season). Hoke's Wolverines lost to Iowa 24-21 on Saturday and with an impending game against Ohio State -- a team that seems to be a heavy, heavy favorite in nearly every matchup on paper -- Michigan is trying to answer questions in seven days that it could take seven months to fix. If they lose, the Wolverines will finish 3-5 in the Big Ten this season -- the same record Rodriguez finished with in his third year at the helm of the team. Under Hoke, Michigan has a 26-11 record (15-8 Big Ten), but in marquee matchups, it has faltered. The Wolverines are 1-2 against Michigan State, 1-1 against Ohio State and 1-1 in bowl games, and they have yet to win two consecutive road games. And their product -- an Al Borges-led offense that has finally implemented a non-Denard Robinson quarterback -- has seemed to regress this season with Devin Gardner, which has fans calling for firings as well as a the starting of true freshman QB Shane Morris and his other young teammates, the ballyhooed recruits of Hoke. Maybe Hoke's and Muschamp's shortcomings this season wouldn't seem so bad if their teams and fan bases hadn't already experienced success in those coaches' tenures, if they had gradually built rather than delivering in their first or second seasons. Or maybe it wouldn't seem so bad if there weren't coaches out there proving that it's certainly possible to build a team -- combining one's own recruits with a previous coaches' players and implementing new schemes and expectations -- in just three seasons. 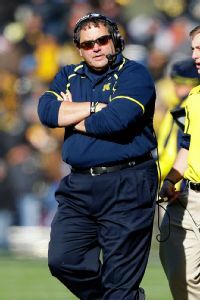 AP Photo/Charlie Neibergall Brady Hoke hasn't been able to find the 11-2 magic of his first season at Michigan. Hoke's team might've gotten the better of Minnesota this season, but the Wolverines certainly must be happy they don't have to play the Gophers at this point in the season. Jerry Kill has his team playing its best football of the year. In three years he has taken a team that was 3-9 in 2010 and turned it into an 8-3 bunch that will finish at least .500 in the Big Ten for the first time since 2005. 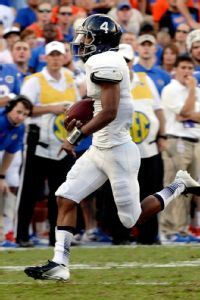 And Vanderbilt's James Franklin, who took over the Commodores after a two-win season in 2010, took care of business against Muschamp's Gators and Georgia in the same season, a program first. Saturday night, Franklin and the Dores defeated in-state rival Tennessee for the second year in a row, something Vandy hasn't accomplished since 1925-26. Vandy can end the year 8-5 with a win over Wake Forest at home on Saturday. With a bowl win, the Commodores would finish with back-to-back nine-win seasons. So it is possible. Maybe not easy. But definitely possible -- Kill and Franklin are proof that the three-year expectation isn't completely out of reach. Patience for Hoke and Muschamp might not be completely gone, but it's wearing thin. The longer the records and product don't improve, the more their explanations are going to sound like excuses. TUCSON, Ariz. -- If you wanted to floridly imagine a cosmic wrath exacted on Oregon on Saturday by the slighted Rose Bowl in Arizona's 42-16 whipping of the Ducks, you would note that the Wildcats were clad head-to-toe in rosy red while they posted their first win over a top-five team since 2007. It would be ridiculous, of course, to further belabor De'Anthony Thomas' and Josh Huff's controversial musings last week about not being excited about the possibility of playing in the Rose Bowl because they had their sights set on the national title game, but the karmic symmetry is impossible to ignore. Turn your nose up at the Granddaddy? Fine, how do you feel about the Alamo Bowl? Or maybe even something a little lower on the Pac-12 bowl pecking order? "The way that was phrased is not representative of the way anybody feels," Oregon coach Mark Helfrich said. "That had nothing at all to do with this." Completely true. What did matter was the Wildcats playing an outstanding game in all three phases and the Ducks looking sloppy and uninterested while getting thrashed. "Very sluggish in every phase. That's 100 percent my fault," Helfrich said. "I have to figure out exactly which levers to pull and buttons to push." There were a lot of notable negative landmarks for Oregon. This was the Ducks' first loss to an unranked team since 2009. The 26-point margin of defeat was their biggest since losing 44-10 to USC in 2008. After four consecutive BCS bowl berths, the Ducks will be playing before the New Year this postseason. Stanford wins the North Division for the second consecutive year. To read Ted Miller's full story, click here. EVANSTON, Ill. -- There are few seasons where rivalry week in the Big Ten feels like an afterthought, but this is one of them. Can we fast-forward to Dec. 7 already? The matchup just about every impartial observer wanted in the Big Ten championship is taking place: Ohio State versus Michigan State. It's the Buckeyes' explosive offense against Michigan State's suffocating defense. It's a blossoming Spartans offense against a young but talented Buckeyes defense. It's Urban Meyer against Mark Dantonio. And unlike the first two Big Ten title games, it's a pairing we have yet to see so far this season. It's also a team with potentially a 24-game winning streak and national title hopes (Ohio State) against one trying to go to the Rose Bowl for the first time in a quarter-century (Michigan State). So we have to endure Week 14, which will provide the standard rivalry fare, including, of course, Ohio State visiting Michigan. But there's a sizable gulf between those programs right now. The Game takes place Saturday at Michigan Stadium. The Game Everyone Wants To See takes place the following week at Lucas Oil Stadium. Go ahead and find a better conference championship game out there. Florida State-Duke? Love what David Cutcliffe has done, but I'll pass. The Pac-12 championship should be fun, but it will feature teams with multiple losses. The SEC title game will display plenty of future pros, but next week's Iron Bowl is far more compelling. The Big Ten isn't the nation's best league, but it has the nation's most exciting title game. To read Adam Rittenberg's full story, click here. Before the 2013 season began, ACC watchers believed the Coastal Division could go a number of different ways. Indeed, four teams received first-place votes in preseason polling in July. None of those teams was named Duke. Now, with one final week left in the regular season, the Blue Devils -- not Miami, or Virginia Tech or Georgia Tech or North Carolina -- sit in control of the Coastal Division. After a hard-fought 28-21 win over Wake Forest on Saturday, all Duke needs to do is beat North Carolina next week in Chapel Hill to win the Coastal Division outright, secure its first trip to the ACC championship game and earn a date with Atlantic Division champ Florida State. And yet, this will be perhaps the most pressure-packed game Duke football has played in its modern history, against a surging archrival that put up 80 in a victory over Old Dominion on Saturday. Both teams enter the game on long winning streaks -- Duke has won seven straight; UNC has won five straight to become bowl-eligible after a horrendous 1-5 start. If Duke falters, well, the door remains open for several other Coastal contenders. Miami beat Virginia 45-26 on Saturday to keep its slim division hopes alive. The Canes need to beat Pitt on Friday, and then have Duke and Virginia Tech lose. Virginia Tech must beat Virginia next week to have any shot at the crown. Georgia Tech, already in the clubhouse with a 5-3 mark in the ACC, needs Virginia Tech to lose to have any chance. A five-way tie atop the division remains possible. If North Carolina beats Duke, and Miami and Virginia Tech win, then they would join the Jackets at 5-3 in division play. Virginia Tech would win in a five-way tie based on its 5-1 Coastal Division record. To read Andrea Adelson's full story, click here. STILLWATER, Okla. -- With nine minutes still to be played, America's top offense finally had enough. So instead of going for another seemingly hopeless fourth-and-long, Baylor called its record-setting offense to the sideline and sent out the punt team. On the other side of the field, sensing the capitulation, Oklahoma State defensive coordinator Glenn Spencer began hopping up and down, slapping the helmet of any defender passing by his general vicinity. 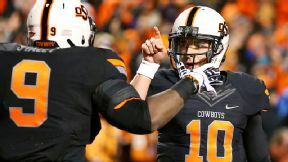 The 10th-ranked Cowboys always believed they could knock off fourth-ranked Baylor. But nobody, from "College GameDay" guest picker Marcus Smart to the Cowboys themselves, thought they would put the mighty Bears away before the fourth quarter. Yet, Saturday night before a sold-out Boone Pickens Stadium, Oklahoma State did exactly that, pummeling Baylor into submission 49-17 to ensure the Big 12 title will go through Stillwater. "We weren't intimidated," said Cowboys linebacker Caleb Lavey. "And we were able to shut them down." No defense had slowed the Bears down all year, much less shut them down. Baylor came into the night leading the nation with 61 points per game. After three quarters in Stillwater, the Bears had managed a single field goal. "The Baylor offense deserved to get the pub it was getting," Lavey said. "So being able to keep them off the board in touchdowns until the fourth quarter says a lot about this defense. Our defense did a great job." Great doesn't do it justice. The Big 12's best defense was dominant. To read Jake Trotter's full story, click here. That's where the Week 13 Takeaways begin on the strangest Saturday of the season. Favorites fell, Heisman contenders struggled and, man, was it cold. The chill made it even to Baton Rouge, where LSU shut down Johnny Manziel in a way we have never before seen. I had been in Will Muschamp's corner, believing crippling injuries this season (QB Jeff Driskel and DT Dominique Easley among them) had created an impossible situation for Florida to win Southeastern Conference games. But losing to a Southern Conference opponent? That's different. Georgia Southern didn't complete a pass Saturday, but it did win a game at Florida. It was the Gators' sixth consecutive loss, bringing their record to 4-7. Welcome to rock bottom in the Swamp, which has had all the energy of a puddle for the better part of two months. And now AD Jeremy Foley, university president Bernie Machen and the school's big-money donors are in a strange spot. They had all publicly supported Muschamp and his staff, but that was before Georgia Southern. Losing to Georgia Southern seemed unfathomable. It's still difficult to figure out how that could happen, considering the talent on both sidelines and the fact that UF played South Carolina tough the week before. To read Travis Haney's full story, click here . 1. The performance of Baylor and Oregon on Saturday made the up-tempo spread offense look as faddish as the latest Free People catalog. If historians look back at this weekend as the crest of this wave, they will find a system that had the biggest impact on the offensive side of the ball since the wishbone, with the big asterisk that no one has won a national title. At its heart, the up-tempo spread compensates for what teams don't have: the ability to win the blocking and tackling battles that have defined the game for more than a century. Teams that win those continue to take home the crystal football. 2. Bob Stoops won his 158th game at Oklahoma, surpassing Barry Switzer to become the all-time leader at a school that has had three College Football Hall of Fame coaches (Switzer, Bud Wilkinson and Bennie Owen). Stoops won those games in 15 seasons, one fewer than Switzer. But Switzer coached 11-game regular seasons. He needed only 180 games to get to 157. Stoops needed 197 games to get to 158. 3. Didn't have Boston College tailback Andre Williams on your preseason Heisman ballot? Here's why: In his first three seasons, Williams rushed for 1,562 yards and 10 touchdowns. He had 584 yards and four scores in an injury-shortened 2012. This season, Williams has had 602 yards and four touchdowns -- in the past two games. Running in the mash-'em-up offense of first-year coach Steve Addazio, Williams became the first 2,000-yard back in the FBS in six seasons. He's on plenty of Heisman ballots now. One of the most remarkable things about teams that compete for championships consistently is the ability to avoid meltdowns under pressure. It happens to every team from time to time, but Baylor crumbled in the face of pressure in a big game for the Bears. I think that in a different way, Oregon crumbled under pressure -- some of it self-imposed by a couple of players saying they weren't interested in the Rose Bowl -- and the Ducks didn't stay focused on the task at hand. It's remarkable the teams that can stay focused on the task at hand and not give in, particularly the teams that haven't been there before. I was particularly impressed with Missouri. Ole Miss is a dangerous team and the game was in a hostile environment, a night game on the road with some pressure trying to win out knowing that South Carolina is waiting for a stumble. And I thought the Tigers performed admirably and really played well. While Johnny Manziel's performance against LSU was the worst of his career -- and frankly by far the worst I've ever seen from him -- and he probably played his way out of the Heisman race this year, it doesn't change the fact that he's the best player in the country. I don't think it would be crazy for people to vote for him, but sometimes you have to balance the subjectivity with a bit of objectivity in terms of performance in big games. The fact of the matter is as brilliant as Manziel has been, in each of the Aggies' losses he has made critical errors. That is compounded by the fact that he has to overcome the poor Aggies defense, but if you're going to win the Heisman two times on a non-championship team, you need to rise above that. Given my choice of any college player, he's the one I'd build by team around, but he didn't stack up Saturday. The pressure of November is definitely evident, particularly at the end of the month when you get into major conference games. Baylor had an opportunity to do something, and it didn't. Arizona State did, and it's going to be playing in the Pac-12 championship. Heck of a year by the Arizona State coaching staff; Taylor Kelly and the offense did a great job. Oklahoma State was dominant in every facet of the game. It was surprising, given the way that Baylor has played this entire season, that it would get shut down offensively like it did. No one previously had been able to slow the Bears down. LSU defensive coordinator John Chavis has Johnny Manziel's number for some reason. The last two years that defense has contained him. His worst two games have been against LSU, and he just can't get over the hump against that team. For Alabama and Florida State, they did what they had to do, taking care of business to remain Nos. 1 and 3. So did Ohio State, which will stay in third with Baylor's loss. All won impressively, as they should have. As for the Heisman race, everybody is playing their way out of the race. Andre Williams is the only player who has played his way into the race, with nearly 900 rushing yards over the last three weeks. During the season, crazy things happen. How in the world did Utah beat Stanford, West Virginia beat Oklahoma State and Tennessee beat South Carolina? It goes on and on. The Heisman race, instead of dwindling down, is becoming more wide open. Three Heisman hopefuls -- Manziel, Marcus Mariota and Bryce Petty -- had very bad days while their teams lost decisively. At the beginning of the year, everybody was talking about Teddy Bridgewater and Manziel, but nobody thought that Jameis Winston would be the leading candidate. I think that AJ McCarron has had an outstanding year. Now we come down to games that determine the championship. Auburn-Alabama, Missouri-Texas A&M. But we also have some great personal rivalries that always take over at this time of year. Next week is probably the best week of college football, with games from Thursday through Saturday. You have Ohio State-Michigan, a natural rivalry. You have Mississippi State-Ole Miss in the Egg Bowl, Clemson-South Carolina in a meeting of top-10 teams. Out west there's USC-UCLA. Florida-Florida State, even if the teams are heading in opposite directions, it's a great rivalry and crazy things happen. Click below to see what our reporters learned in each conference after the 13th weekend. Every week our reporters will hand out helmet stickers to the week's top players, coaches, teams or anything else worth this honor. For a recap of Saturday's best college football tweets, pictures, videos, statistical factoids and more, visit this week's Campus Connection.